A few attractive dividend stocks for investors who prize consistent, and growing, income. It takes time -- in many cases years -- for significant stock market returns to accrue to investors. A wide range of negative factors can depress a shareholder's unrealized gains in the meantime, including earnings swings, market downturns, or strategic stumbles on the part of management. If you're the type of investor who prefers small but immediate returns to complement these big, but slowly developing, growth bets, then consider bulking your portfolio up with high-quality stocks that pay out a hefty dividend. Ideally, these candidates will pair above-average yields with promising growth potential, as is the case with Hasbro (NASDAQ:HAS), Johnson & Johnson (NYSE:JNJ), and Home Depot (NYSE:HD) today. Hasbro recently closed the books on an impressive fiscal year in which sales passed $5 billion for the first time as operating profit jumped 14%, to nearly $800 million. Yes, the toy maker got a big assist from licensing partnerships like the Disney Princess lineup that powered a 50% revenue surge in the girls division. But Hasbro's owned franchises are kicking in solid contributions, too. Sales from core brands including Nerf, My Little Pony, and Transformers have risen at a double-digit compound annual rate over the last decade. Hasbro executives haven't been shy about sharing those rising operating earnings with investors. Dividend hikes averaged 14% per year over the last 10 years, including 2017's 12% raise. The company has a good shot at posting another record operating year ahead, with plenty riding on the fiscal third and fourth quarters. Besides carrying their traditional holiday-season spike, these quarters will benefit from major movie releases including a My Little Pony film in October and Star Wars: The Last Jedi in December. A 2.3% dividend payout should help keep investors patient while they wait to see if these hits will push the toys and games giant's business further into record territory this year. Home Depot may not be a Dividend Aristocrat (with at least 25 consecutive years of annual payout raises) like rival Lowe's (NYSE:LOW), but it comes out ahead on many other important income metrics. The home improvement giant just announced a 29% payout hike, its biggest raise since 2013, as its net income rose to $8 billion, up from a financial-crisis low of less than $3 billion. Home Depot began the year with a generous capital return policy that only got better from there. Since 2010, it has been sending roughly 50% of earnings to shareholders in dividends, compared to the 35% target at rival Lowe's. But rising profitability, market-share wins, and surging e-commerce sales convinced management to boost that payout target to 55% beginning this year. Income investors can expect steady strengthening of the housing market to push the retailer past its goals of $100 billion of annual revenue and a 15% operating margin in 2017, likely a full year ahead of the company's long-term plan. At over $300 billion in market capitalization, Johnson & Johnson is undeniably big. But that doesn't mean that the healthcare giant can't grow at an impressive pace. Sales rose 7% last year after accounting for currency swings, and adjusted earnings improved at an even faster clip. The company's massive pharmaceutical business turned in double-digit gains, and the medical device and consumer product segments kicked in solid growth as well. Better still, Johnson & Johnson isn't resting on its past successes to drive operating results. The company dedicates $9 billion to research and development, and that aggressive bet helps explain why roughly 25% of sales come from products that were launched just within the past five years. 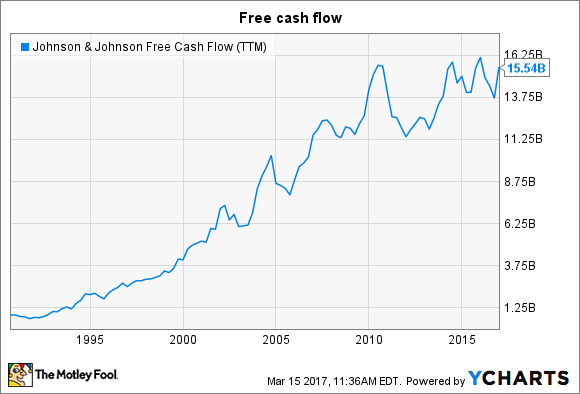 JNJ Free Cash Flow (TTM) data by YCharts. The company traditionally returns about 70% of its free cash flow directly to investors, mainly in the form of dividends. If that figure keeps churning higher, as it has over the long term, the outlook for this 54-year-old payout will remain bright.